Join the Skillshare Film Team on the road with Aaron Draplin — iconic designer, hit Skillshare teacher, and legendary man of mystery. 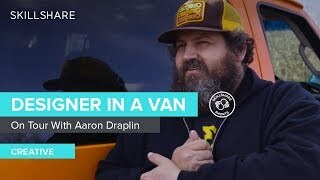 In 2017, Draplin hit the road in a one-of-a-kind orange van to meet with fans, students, and designers for a book tour unlike anything a designer has done before. Inspired by the DIY and punk bands before him who have taken their tours into their own hands, he and his partner Leigh McKolay did all of the scouting, booking, driving, talking, hyping, fighting, making up, and making it work — all the while shipping merch and running the Draplin Design Company (DDC) from the backseat. How does he make it work? Whether you’re a creative searching for inspiration, a Draplin fan, or simply curious for a real-world look at a successful side hustle, see how Draplin has built an iconic career from the ground up . . . all from his signature orange van. Skillshare is an online learning community for creators. We’re on a mission to unlock universal access to learning. For just $8 a month, you can choose from thousands of classes in design, business, photography, and more — and take them anywhere, anytime. Learn, collaborate, and even teach a class of your own. Aaron Draplin is a nice guy. Amazing work! This man is such an amazing inspiration that it is frankly a damn shame that none of my non-designer friends know who he is. Everyone could benefit from hearing him talk. The nicest guy ever, he gave me and my friends free passes to his lecture when we were at his Milwaukee workshop. Totally didn’t have too, will always remember and appreciate him for that. Love this guy!!! Most down to earth guy ever, especially for a successful designer! This Man is so real, I love it. Absolute heroes the both of them. Thanks for the awesome doco!